Hey there 36thavenuer’s it’s Angelina from JoJo and Eloise, I am a so excited to be here. 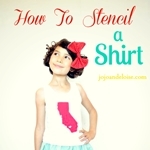 Today I am going to show you how to make your own Stencil as well as how to Stencil your very own t-shirt. and many of those projects use special programs and tools that make and cut the stencil for them. I have yet to cave and purchase one for myself and still do it the old fashioned way. on the 36th Ave done by Mrs. Desiree herself. So for today let’s kick it Old School Style!! so I thought I would share how you can make your own State Stencil. I first started off by asking my Son if he could draw the California State for me. I purchased a Blank Solid Stencil Card. I took my Image and placed it underneath and pencil traced it onto my Stencil Card. I used some Temporary Fabric Adhesive Spray to hold my Stencil in place on my T-shrit. It helps the Stencil from moving around. I then place a piece of cardboard on the inside of my t-shirt to keep the paint from bleeding through. I used regular acrylic paint and added a fabric medium to it, in order to make it washable. I lightly added my paint to my Stencil Sponge Brush and tapped lightly while filling in my Space. Be sure to take extra care around the edges of your stencil, not adding to much paint or pushing it in. Tapping up and Down is your best option. Continue to do that until your Pattern is fully covered evenly. Let it dry and then carefully pull your Stencil up and away from your fabric. I wanted to make this a customized State shirt, so I put a Heart in the place of where we live. You could do the same or even put a Heart or Dots on the locations you may be traveling to as a family. For the Heart Paint I followed the same instructions as I did on the State. Using my Fabric Medium. So have fun and get creative and go make some stencils. Very cute and I love the idea of stenciling your own State! And this adorable Layered Skirt Tutorial. Also follow Angelina on Pinterest, Facebook, and Twitter. Adorable as always! I love this project so much, just beautiful! This is so cute, love the little heart, an adorable detail! So lovely stencil and wonderful tutorial, thank you so much, love that little heart 🙂 thank you for sharing and have a great weekend both of you lovely Ladies! I love this California silhouette! Thanks for a fun tutorial! Oh my goodness, this is so, so, so sweet!! I absolutely love how easy to make and darling this turned out!